A couple of weeks ago, we had some huge wildfires break out in Utah and many of our friends had to evacuate their homes. Some of them only had a matter of minutes to run through their house and grab things they would need to get through the next couple of days because they didn’t know when they would be able to return (IF they were able to return). In some cases, the police officers stood in their doorway and waited while they ran around, trying to get them out as fast as possible. You might even remember the scary incident our sister Kristen had when she had only a matter of minutes in the middle of the night to get out of her house . . . In the days since then, I have thought a lot about what I would have grabbed had I been given a couple of minutes to get those things that are most important to me . . . and to be honest, it has kind of been stressing me out. We do have a 72 hour kit, but it’s getting outdated and with a new baby on the way, I have been thinking about the things I need to add to it for our baby. If you are starting from scratch, it can be pretty intimidating to put a 72 hour kit together. Our sister Elyse shared everything that she put into hers here, so you can check out her list for even more ideas. Years ago, a good friend gave me a list of how to build your 72 hour kit and be prepared for an emergency over 52 weeks time. When it is broken down week-by-week , it is not such a daunting task. If you wanted to put it together even quicker, you could do 2-3 assignments each week and have it ready in a fraction of the time! Prepare a separate bag for each member of your family, even the small children. That way if you get separated, at least you know that your family member will have the essential items that they need to get by for a short amount of time. Click here for the prinatble list. I am in no way saying that this items have to be in your 72 hour kit. These are just some ideas to help you get started. These supplies are very basic and could be kept in an easy-to-carry container in case you had to evacuate in a short amount of time. Each member of your family should have their own 72 hour kit, even the smallest members of your family. Some of the items listed are not appropriate for children (matches, knives, etc) and you can decide what is going to be best for your family members. Anything on this list can be substituted to suit the needs of your family. Week 1: Obtain a suitable 72-hour-kit container (backpack, duffel bag, garbage can with lid). Have one for each member of your family. Week 2: Check the batteries in your smoke detector. Week 3: Place a flashlight next to your bed and one in an alternate location; check batteries. Place flashlight in each of your children’s rooms and let them know where it is. Week 4: Add 3 gallons of water to your 72 hour kit (The Red Cross recommends 1 gallon per person per day). The water would take up a lot of room in your pack, so you could keep some water bottles in your pack (maybe about a gallons worth) and keep the rest in containers that can be carried in your arms. Decide what will be best for your family. Sometimes clean water is the most rare commodity in emergencies and not only will it be used for drinking, but also for cleaning. The Red Cross also recommends having a 2 week water supply in your home, just in case clean water is not available. Week 5: Add $10 cash to 72 hour kit (the smaller the bills, the better). Week 6: Add a manual can opener to 72 hour kit. Week 7: Add 2 cans of tuna fish/canned meat to 72 hour kit. Week 8: Add 1 roll large paper towels to 72 hour kit. Week 9: Add 1 emergency blanket to 72 hour kit. Week 10: Add $10 cash to 72 hour kit. Week 11: Add 4 rolls of toilet paper to 72 hour kit. Week 12: Add 1 bar of soap to 72 hour kit. Week 13: Add stress relief factors to 72 hour kit (books, magazines, coloring books, playing cards, games, crossword puzzles, Sudoku, etc). Week 14: Add pocket/utility knife to 72 hour kit. Week 15: Add $10 cash to 72 hour kit. Week 16: Add 1 container of baby wipes to 72 hour kit. Week 17: Add 1 change of clothing to 72 hour kit. Week 18: Add non-perishable, easy-to-prepare food items to 72 hour kit (granola bars, oatmeal bars, trail mix, beef jerky, canned ravioli, etc. Date for rotation. Get enough to last you for at least 3 days). Week 19: Add 1 can of fruit and 1 can of vegetables to 72 hour kit (date for rotation). Make sure they have the pull-tab on top for easy opening. Week 20: Add $10 cash to 72 hour kit. Week 21: Add 1 box of waterproof matches and 1 lighter to 72 hour kit. Week 22: Add hard candy (Jolly Ranchers, Lifesavers) to 72 hour kit. Week 23: Add one container of peanut butter (or other protein) to each 72 hour kit. Week 24: Add Ziploc bags (variety of sizes) to 72 hour kit. Week 25: Add $10 cash to 72 hour kit. Week 26: Check the batteries in your smoke detector. Practice escape routes with your family and have an emergency plan. Week 27: Add 1 box of crackers and 1 can (48 oz) of non-carbonated fruit juice to 72 hour kit. Week 28: Add plastic utensils, paper plates, and a couple of paper cups to 72 hour kit. (I just put enough for 1 person for a couple of meals in a large Ziploc bag). Week 29: Add 1 roll of duct tape to 72 hour kit. Week 30: Add $10 cash to 72 hour kit. Week 31: Add 1 lb graham crackers to 72 hour kit. Week 32: Add flashlight to 72 hour kit and extra batteries. Week 33: Add disinfectant (betadine, bleach, sterile wipes, hand sanitizer) to 72 hour kit. Week 34: Add 1 pair of work gloves to 72 hour kit. Week 35: Add $10 cash to 72 hour kit. Week 36: Add basic first-aid kit to 72 hour kit. Week 37: Add 1 lb dried fruit to 72 hour kit (date for rotation). Week 38: Add 1/2 lb dried milk to 72 hour kit. Also add one box of cereal. Week 39: Add battery-powered or hand-crank radio to 72 hour kit (add extra batteries if it is battery powered). Week 40: Add $10 cash to 72 hour kit. Week 41: Add items related to individual medical needs to 72 hour kit. Have at least a 7-day supply. Also include items such as hearing aids (with extra batteries), glasses, contact lenses, syringes, canes, etc. Week 42: Add feminine hygiene products, and other hygiene products to 72 hour kit (check out this post for ideas). If you have a baby, add diapers, bottles, formula, and baby food. If you have a pet, add pet supplies (collar, leash, ID, food, bowl, etc). Week 43: Add toothbrush and 1 tube of toothpaste to 72 hour kit. Week 44: Add a multi-purpose tool to 72 hour kit (ours have scissors on them also, which is nice). Week 45: Add $10 cash to 72 hour kit. Week 46: Verify each family member’s immunizations (especially tetanus) are up to date. Week 47: Purchase additional cell phone chargers for cell phones in your home and add to 72 hour kit. Week 48: Add pair of scissors to 72 hour kit. Week 49: Add emergency candle to 72 hour kit. Week 50: Add $10 cash to 72 hour kit. Week 51: Make copies of house keys and car keys to keep in 72 hour kit. Week 52: Add photocopies of personal documents to 72 hour kit (wills, insurance policies, birth certificates, medication lists and other medical info, proof of address, deed/lease to home, passports, marriage license, etc). Send 1 copy of each document to family member/friend in separate location. Also add a map of the area and an emergency contact card (with local phone numbers and phone numbers of friends/family outside of the area) to each 72 hour kit. Another idea is to keep pictures of family members in 72 hour kit in case you get separated and need to ask if anyone has seen them. 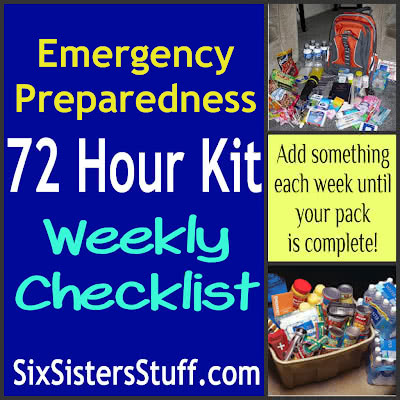 Hopefully you won’t have to use these 72 hour kits, but it’s always better to be prepared (and I promise that it will help you sleep a little more soundly at night knowing that you are just a little more ready for any emergency that might come your way!). For more information, check out the Red Cross’ website for great ideas on how to be ready for an emergency. Awesome post! I really need this, I will be making a kit, thanks for sharing! Fantastic list and post! We live in an area with a lot of tornado warnings and we don't have a basement. Luckily we have family nearby who do so we can go there but I am always having to put together a bag as we are running out the door. This will help me get more proactive - especially since the kids are big enough we don't carry a diaper bag anymore! Thank you for this well timed post. My sisters birthday is this week and she wanted emergency preparedness stuff, this is perfect to get her started and gives me great ideas on what to get her. Question - you say to have a bag for every family member, so is this list of items spread between all the bags? Or is it repeat every step for each bag individually? Sorry if that is a silly question, I've never made one before. It seems like this would be too much for just one bag, but then the 3 gallons of water per person made me think I would need to multiply all other items as well, tell me if I'm wrong? It isn't a silly question at all! This is list is items to add per bag (one bag per person). We bought as big of bags that each person could carry . . . or course our kids can't carry as much as my husband and I, but we wanted each person to have as close to a full supply in case we got separated for some reason. We also tried to purchase things in compact sizes when we could, just so we could pack more in. If you check out my sister's post, you can see all that she was able to fit in just a normal school backpack. This is really awesome and I will be passing it on to my other family members! Thank you! This is a great list and easily doable at the rate of one item a week. I'm motivated to get my kit going. thanks for sharing. this is fantastic. I may have ahem read a few end of the world novels (yeah I'm crazy) and it's had me thinking we need a kit! I found this on Pinterest and it is great. You have realistic food unlike some other lists I've seen. Just a piece of advice though...since you are packing a can opener skip the pop tops on food cans. They have been known to burst (I've read of this happening to several people!) and then you are left with a mess in your bag! Since you are going to have a can opener just go with the run of the mill cans. One thing I also might add are boxes of shelf stable milk like Horizons, maybe one a day per person. I don't know if I skipped over that but they have vanilla and chocolate flavors so you can get the kids to drink them. And everyone will have a calcium boost for the day! My local grocery store often has these on a 10 for $10 sale so that would be the time to stock up! Thanks for such a doable list! Is the top part of the list per person? A lot of the items are to be shared as a family. You can decide what essential items everyone would want in their own individual pack just in case you were separated. But a lot of the items are to be shared among the group. And even that can vary depending on the size of your family. Hope this helps! Is there a PDF for this? I tried the printer friendly button and it is not working. Trying to get this up and running. THanks. I just found the other button. Thanks!